Bridge column, February 29: Will you propose to him today? Sir Winston Churchill said, "I consider that it will be found much better by all parties to leave the past to history, especially as I propose to write that history myself." This is the day when women may propose to men. After that, everything else is history! This deal is tough to get right. One defense looks so obvious and "sure" to work that most players would not even stop to consider that an alternative plan might be needed. East is defending against four spades, having overcalled in hearts. West leads the heart nine, which must be a singleton or from a doubleton. (With 9-x-x, he would lead his lowest heart, since he did not support his partner's suit.) How should East plan the defense? 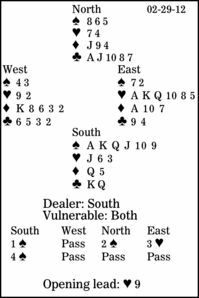 After cashing two heart tricks, and knowing that South has a heart left, East will be tempted to lead a third heart, expecting West to be able to ruff higher than dummy's spade eight. Here, though, that lets declarer collect an overtrick. East should take a safety-play, first cashing the diamond ace. Here, West encourages enthusiastically with his eight, and a second diamond lead defeats the contract. But if West does have a spade higher than dummy's eight, he would discourage in diamonds. If there are two chances to defeat a contract, try both -- if possible.